Sauté in butter thinly sliced onion. Add turmeric, cinnamon, ginger, fry for a minute, next add chicken and fry for 2-3 min, till it is totally covered with spices. Add water/broth, salt, pepper, peeled almonds and let it stew for 30-40 min. You can peel chickpeas, to make it softer, but if you are too lazy – nothing terrible. Add chickpeas, parsley and stew for 10-15 min. Sprinkle with lemon juice and serve. 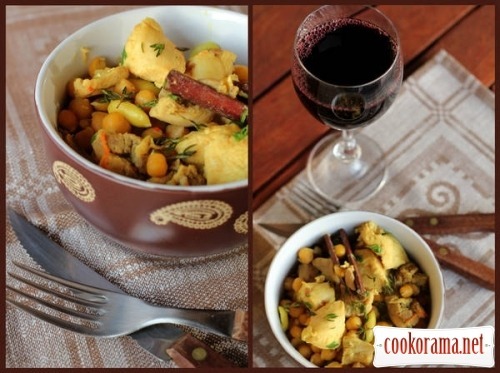 Top of recipe "Chicken with almonds and chickpeas (Chicken K'dra)"
мне тоже очень нравятся Ваши фото! а нут — это чечевица или нет?